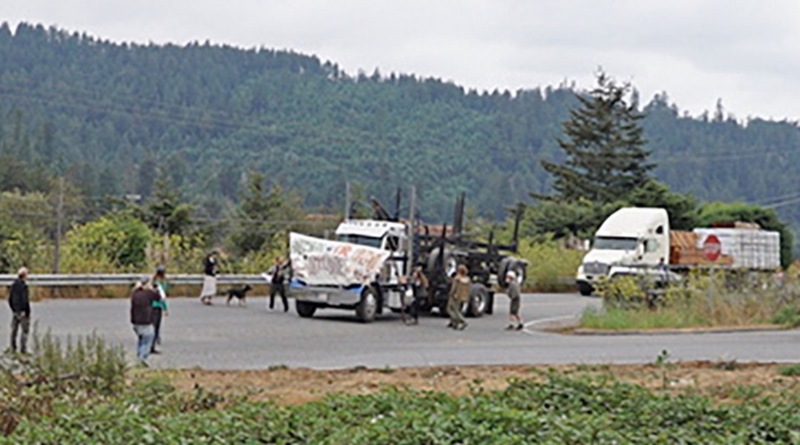 Scotia, CA—A “Week of Action for the Mattole Forest” wrapped up with demonstrations and rallies at the Humboldt Redwood Co. (HRC) corporate offices in Scotia, CA, and then heated up with road blockades nearby at HRC’s lumber mill, as semi-trucks loaded with trees rolled into the facility. Activists held large banners reading “HRC Out of the Mattole,” and “Hack n’ Squirt =Fire Hazard and Puts Communities at Risk,” referring to the practice called hack and squirt that douses hardwoods of less value to the timber company with herbicides, killing the trees and creating huge stands of standing dead timber before loggers go in to cut the more marketable Douglas Fir. As demonstrators talked to some HRC employees and truckers and played music, suddenly a big rig truck with its bed folded up came from the mill and without slowing, plowed through the 15 ft. long banner, being held by people at either side, with others gathered around the banner. As people frantically leapt out of the way, yelling at the driver to stop, he kept going, narrowly missing a number of people as they scattered; check the video below. At issue for the Mattole Forest Defenders is a forest area containing ancient Doug fir trees and threatened species habitat in the Rainbow Ridge area of HRC holdings in the Mattole River watershed in Humboldt County. Residents, restorationists and activists have long advocated for protection of this forest, part of the large acreage purchased by HRC when it formed as an outgrowth of Mendocino Redwood Company, both owned by the Fisher family, whose retail empire includes the Gap, Banana Republic and Old Navy stores. The land changed hands when the former owner, Maxxam’s Pacific Lumber, went bankrupt in 2008 after their rapacious logging of ancient redwood forests spawned the so-called “timber wars” of the late 80’s, 90’s and early 2000’s. Residents and restoration workers of the Mattole area formed the Lost Coast League to try to purchase the 1,100-acre Rainbow Ridge forest as a way to preserve the unique forest refugia that supports many rare and threatened species including the Pacific Fisher, Northern Spotted Owl, Coho and Chinook Salmon, Northern goshawk, and a large, rare and old-growth dependent medicinal mushroom, the agarikon (Laricifomes officinalis). 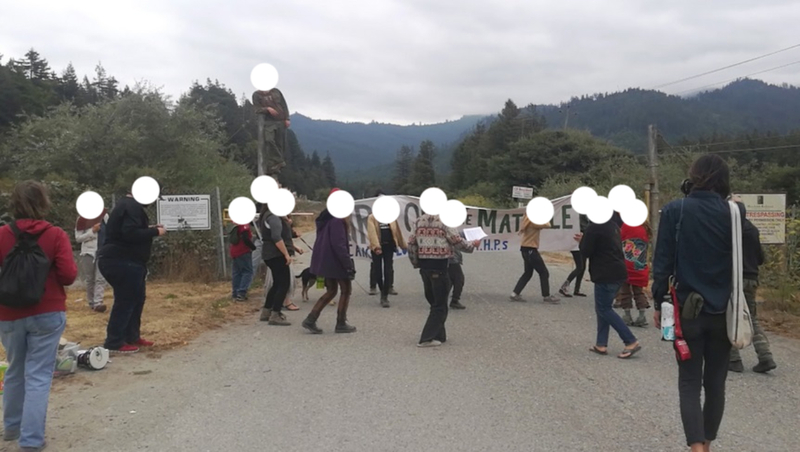 The Forest Defenders, separate from the Lost Coast League but with the same interests, have been using direct action, tree-sits, blockades and forest occupations to hold proposed logging at bay while others try to negotiate with the corporation. The reckless act by the trucker at the HRC mill represents an escalation in threatening behavior, following on the heels of HRC’s hiring of paramilitary security contractors to clear protesters out of the forest. The forest activists are regrouping as the week of action wraps up, intending to carry the forest defense campaign forward for as long as the forest is threatened with herbicides and logging.